The ceramic and porcelain tiles, bathroom materials, and furniture and accessories market in Morocco is primarily dependent on the presence of unorganized regional players and a handful of key international players, such as Roca, RAK Ceramics, NG Kütahya Seramik, PORCELANOSA, and Marazzi. Transparency Market Research has observed that a few regional companies with a significant presence have established a strong and loyal customer base in various cities across Morocco. This has intensified the degree of competition with other local players as well as with international companies supplying imported tiles and other bathroom materials. The ceramic and porcelain tiles, bathroom materials, and furniture and accessories market in Morocco is expected to rise from a valuation of US$1.5 bn in 2015 to US$2.7 bn by 2024. Full-body porcelain tiles led the ceramic and porcelain tiles market in Morocco, accounting for a 34.6% share in 2015. The segment is also projected to witness strong growth over the coming years. Registering a 7.3% CAGR from 2016 to 2024, glazed porcelain is likely to emerge as the most attractive investment option for the market. Thin tiles are a relatively newer generation of ceramic and porcelain tiles and the segment is expected to be highly lucrative in the near future. Within the bathroom materials market in Morocco, ceramic led the market for floor as well as wall materials. On the other hand, porcelain was the most rapidly expanding segment in both cases. The bathroom furniture and accessories market is dominated by the bath and sanitary ware segment and faucets are anticipated to register a high growth rate during the forecast period. 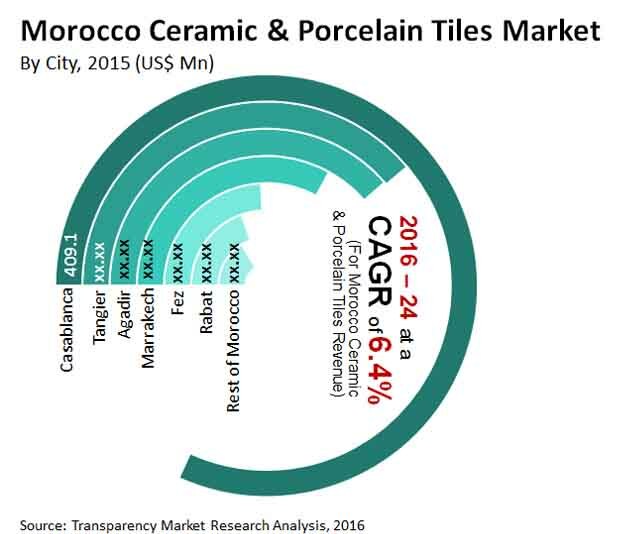 Casablanca led the ceramic and porcelain tiles, bathroom materials, and furniture and accessories market in Morocco, accounting for a share of more than 30% in 2015. Tangier, on the other hand, is projected to be the most lucrative market, exhibiting a CAGR of over 6% from 2016 to 2024. Morocco has gained much popularity as a tourist destination in the recent past, with an estimated 9.8 mn tourists in 2011 alone. “A surge in the inflow of tourists translates into a rise in the construction of hotels, thereby driving the demand for ceramic and porcelain tiles, bathroom materials, and furniture and accessories,” the TMR analyst states. Further supporting the building and construction sector is the Government of Morocco, with its efforts in undertaking new construction projects under its housing scheme. The promise to construct 150,000 social housing units by 2020 and the rise in the renovation of old properties is anticipated to boost the market for ceramic and porcelain tiles, bathroom materials, and furniture and accessories in Morocco. There are several factors that are going against the Morocco ceramic and porcelain tiles, bathroom materials, and furniture and accessories market, the key one being the availability of substitutes. “On the one hand, porcelain and ceramic tiles are higher priced compared to tiles made of cement and terracotta, or even zellige tiles,” the author of the study points out. “Moreover, the benefits offered by cement tiles, for instance, are many, including water resistance, durability, and environment-friendliness.” This drives consumers to opt for the substitute rather than porcelain and ceramic tiles. Another factor acting as a deterrent is the fact that construction activities in Morocco are limited to just a few major cities. Marrakech, Casablanca, Tangier, and Agadir are among the cities that have been reporting a rise in construction projects. This is likely to restrict the demand for ceramic and porcelain tiles, bathroom materials, and furniture and accessories in the rest of the country.